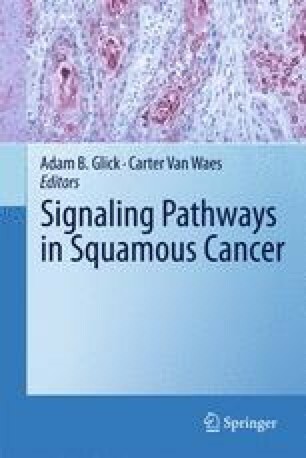 A large body of experimental and clinical data provides strong evidence for an important role of the activator protein-1 (AP-1) in normal epithelial development and homeostasis, and that deregulated AP-1 activity contributes to pathophysiological processes, including neoplastic transformation of keratinocytes and malignant progression of tumor cells. AP-1 is a dimeric transcription factor mainly composed of members of the Jun and Fos families, which are key nuclear targets of several signal transduction pathways, particularly those involving the activation of mitogen-activated protein kinases. The analysis of genetically modified mouse models and cell lines derived thereof has provided important new insights how Jun and Fos proteins regulate cellular processes of keratinocyte differentiation, proliferation, survival and neoplastic transformation. Although some direct AP-1 target genes such as matrix metalloproteinases have been identified, further genome-wide and functional approaches will be required to comprehensively understand the causal connectivity between altered AP-1 function and squamous cell carcinogenesis. Our work was supported by the German Ministry for Education and Research (National Genome Research Network NGFN-2), the Deutsche Krebshilfe e.V., the Initiative and Networking Fund of the Helmholtz Association within the Helmholtz Alliance on Systems Biology, and by the Studienstiftung des deutschen Volkes.